Editor's Note: This is the second of a three-part series by the author. To read part one, click here. To read part three, click here. Private landowners in Texas who desire to retain ownership of their land into the future face daunting challenges. Not the least of these is the challenge of financial sustainability. For many landowners, traditional agriculture may not generate reliable or sufficient revenues. New generations of owners may not live on the land or even close by, or they may not be interested in farming or ranching the land as did earlier generations. Provisions of the federal tax code and emerging markets in ecosystem services (often created by regulation or the need of urban areas to plan for green infrastructure) may provide opportunities for landowners to generate revenues in ways that are compatible with their long-term objectives without selling or developing their land. Fred W. Shield, my maternal grandfather, was an independent oilman from a hardscrabble cotton farm near Brady. When he became successful, he began to buy land. Interestingly, to date, none of the ranches he purchased have ever seen mineral production. This has in one sense been the best of both worlds. My family has had the benefit of financial resources from an unrelated business to manage the land for its conservation values, without the adverse impacts of oil and gas production on our property. Even so, the costs of land ownership and stewardship are high. Additionally, we face a significant tax liability at the point of generational transfer of ownership of the ranch within the family. Like many other landowners, we have sought to ensure that we do not have to sell land to pay estate taxes. Fortunately, there are opportunities for Texas families to participate in programs that incentivize or compensate landowners for the sound stewardship of the land that provides a needed public service. In 1998 and 1999, after ten years of deliberation, my family placed approximately ninety-five percent of our ranch in Travis County under two conservation easements. The first easement was donated to the Nature Conservancy. The second, on adjoining acreage, was sold to the City of Austin as part of a voter-approved bond referendum to protect lands that contribute to water quality and quantity in the Barton Springs segment of the Edwards Aquifer. Together, these easements extinguished most of the development rights on the ranch, which was the family’s objective. These easement transactions also provided some financial benefits to the family. The donated easement resulted in a charitable donation that partially offset the impact of the capital gains from the sale of the easement to the City of Austin. It allowed some family members to significantly reduce their tax liability on the taxable sale of an unrelated business. Assuming the current estate tax, the donated easement will also considerably reduce the family’s estate tax liability when a generational transfer occurs within the family. The sale of an easement to the City of Austin allowed family members to realize part of the value of the land while retaining ownership of the property for traditional uses such as ranching, hunting, and recreation. Several developable tracts with road frontage were excluded from the easements. These tracts could be sold or developed at some point in the future to generate capital for the family or for the private foundation that will one day own and operate a significant portion of the ranch for charitable purposes. In 2012, our family realized an opportunity to sell a conservation easement on a portion of another ranch we own in Real County on the western edge of the Hill Country. This land was permanently protected as mitigation for the impacts of a large electric transmission line (elsewhere in the region) on habitat for the federally-listed Black-capped Vireo. We had been managing habitat for the benefit of this species, and we had documented our efforts and the corresponding increase in the vireo population on our ranch. We submitted a proposal in a competitive bidding process and were awarded the Black-capped Vireo mitigation for this project. We generated significant revenues for the family by providing a service needed by the utility under the terms of its Habitat Conservation Plan (as required by the Endangered Species Act). In turn, we assumed an ongoing obligation to manage for the benefit of the species, consistent with our objectives for the ranch. The proceeds from the sale of conservation credits for endangered species habitat provide a source of funding to offset the costs associated with that management (brush control, prescribed burning, control of exotic ungulates, and biological surveys). The Nature Conservancy holds a conservation easement on the protected portion of the ranch, and we report annually to the U.S Fish and Wildlife Service on activities conducted in accordance with our Management Plan. 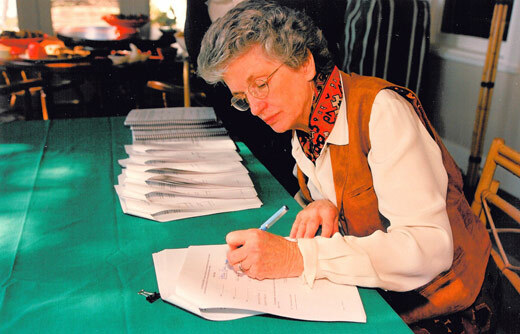 Patricia Shield Ayres signs a conservation easement agreement in 1998. Private conservation organizations can often assist a landowner in determining whether their land might be of value to other potential partners interested in land, water, and cultural resource protection. In 2015, enhanced incentives for donated conservation easements were made permanent in the federal tax code, enabling more landowners to benefit from the donation or bargain sale of a conservation easement. It’s also important to remember that easements reduce but do not eliminate the value of the land. And of course, the owners may still sell the property or pass the land along to heirs (subject to the easement). Financial incentives aside (or when they are not that helpful to the circumstances of a particular landowner), the gift of a conservation easement can be a profoundly fulfilling act of philanthropy. Revenue-generating eco-system services that protect the conservation values of private lands for the public good can be a critical component of a broader strategy for landowning families striving to ensure the financial sustainability of their operation.